Home Reviews Can the Brother CS5055PRW Sewing Machine Sew Up Your Fashion Dreams? For more than seventeen seasons, Project Runway has stoked the dreams of budding designers. 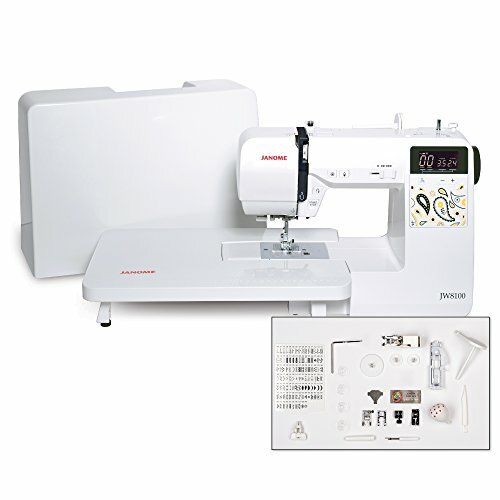 The Brother CS5055PRW "Project Runway" sewing machine emerged to help textile artists chase those dreams. It's not the only one, though. In fact, Brother has put out an entire line of four Project Runway-inspired sewing machines for home sewing enthusiasts. These include a wide-table all-purpose computerized machine, a straight-stitch machine, a portable, and the versatile Brother CS5055PRW. We've all seen cross-merchandising before, and often it amounts to a fancy label stuck onto a subpar product to make it sell better. But to look at the reviews, this isn't the case with the CS5055PRW. 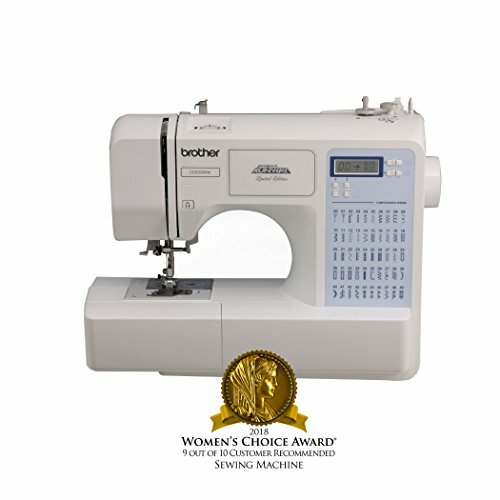 This all-purpose computerized sewing machine has made a number of "best of" lists, including those from She Likes to Sew, Suzy Quilts, and Sewing Machine Judge. And people who have purchased the machine seem to love it as well. It's true -- this machine has a lot to recommend it. However, it's probably not for everybody. What about you? Can Brother's Project Runway inspired all-purpose sewing machine make your fashionista dreams come true? Are You Shopping for a Sewing Machine? How About Something More Advanced? Shopping for a sewing machine can be a nightmare of terms, features, accessory bundles, and price ranges that go from surprisingly affordable to straight out of reach. If you're not sure where to start, it can be hard to make heads or tails of it. Which features do you really need, and which are just there to push up the price? And what are the different kinds of machines? Most importantly, what kind of machine is best for your purpose and skill level? The first thing you're going to want to consider is whether you need an all-purpose machine or a specialized machine. An all-purpose sewing machine does a lot of different things. You can use it for quilting, garment-making, and most other home sewing purposes. An all-purpose sewing machine is often the best fit for the needs of the average home sewing enthusiast. All-purpose sewing machines are also generally reasonably priced. Specialized sewing machines do one thing, and they do it well. Straight stitch machines, for example, sew only straight (and sometimes zig-zag) stitches. Garment factories and sailmakers often use straight stitch machines. An embroidery machine only does decorative embroidery but does not sew. A serger is used for binding off edges and nothing else. Specialized sewing machines do their task at a semi-professional or professional level. For this reason, they can cost $1,000 and up. If you're starting a business doing a single kind of sewing, you should consider a specialized machine that will do that one task at a high level. Home and semi-professional sewing machines come in three different types: manual, electronic, and computerized. Each has its advantages and disadvantages. Which one is right for you? A manual sewing machine has knobs and levers that allow you to adjust the stitch length and width, thread tension, and other factors. This allows you ultimate control over your stitches' appearance. This control, however, often comes at the expense of precision. Manual machines tend to have a simpler interface. They're also less expensive. You can find many excellent models for under $150 - $200. Both of these factors make them a favorite for beginners. An electronic sewing machine like the Brother CS5055PRW is a midpoint between a manual machine and a computerized machine. It typically comes with an impressive array of pre-programmed stitches and buttonholes, and users can adjust their length and width. Electronic machines can be more expensive than manual ones, but generally not prohibitively so. You can find many for between $150 and $300. Sometimes people use the terms "electronic" and "computerized" interchangeably when it comes to sewing machines. But there is one significant difference. Higher-end computerized machines allow you to add to your machine's stitch library by uploading stitches, fonts, and patterns that you find on the Internet. Sometimes you can even edit the pre-programmed stitches right on the machine. Advanced and semi-professional textile artists, embroiderers, and quilters may find this feature worthwhile. Others, on the other hand, might not use it at all. Computerized machines can cost anywhere from $300 on up. If you want to get the best sewing machine for your budget, you're going to have to think hard about features and accessories. What kind of sewing do you do? Do you need hundreds of decorative stitches? Will you use the fifteen presser feet that might come with a certain model? What about a knee-lifter? For quilters, the lever that allows you to raise the presser foot is definitely worth a price bump. For others, maybe not so much. The Brother CS5055PRW is a low-level electronic all-purpose sewing machine. It has a library of 50 pre-programmed stitches, 85 stitch functions, and five one-step buttonholes. What's the difference between a stitch and a stitch function? A stitch refers to the shape of the stitch, for example zig-zag, straight stitch, scallop, etc. A stitch function refers to the different ways you can alter the stitch, such as length, width, and thread tension. So, basically, the Brother CS5055PRW has 50 stitch shapes that can be altered in different ways for a total of 85 unique stitches. These are some nice, manageable specs for a beginner sewing machine. It has a simple, user-friendly interface as well. And because it's made by Brother, a well-respected name in sewing machines, one could assume both quality and durability as well. And the price is right -- you can find this machine in lots of places. But what does the market say? First, we scoured the Internet for reviews from respected professional sources like Good Housekeeping and others. We also factored in our own experiences sewing at the amateur, semi-professional, and professional levels. Then we looked at what actual consumers had to say about the machines that they purchased. Finally, we took an unbiased look at some of this machine's competitors. Good Housekeeping Magazine has been advising consumers about home products since 1885. Their textile lab recently reviewed the Brother CS5055PRW and gave it 4.0 stars out of 5. They thought it was an excellent machine for beginners, for one thing. They also liked its easy, intuitive interface. Finally, they praised its ability to sew well through multiple layers, and if you're a quilter, you know how important that is. On the downside, they noted that this machine has no speed adjustment, which means that if you want to control the speed, you have to do it entirely through the foot pedal. This can be tiring and tedious. Sewing Machine Buffs also thought this was an excellent beginner machine. In addition to praising it as good value for money, they also liked the small accessories pack, which came with necessities but no fluff. They were not impressed, however, by the amount of plastic used in construction. Customers who purchased the Brother CS5055PRW on Amazon overwhelmingly liked it, with 86 percent rating it 4.0 or 5.0 stars out of 5. Users, like professional reviewers, considered this machine very good value for money. They admired its durability and said it was an excellent beginner machine. Customer criticisms included frequent jamming of fabric in the bobbin, thread tension issues, and poor customer service. 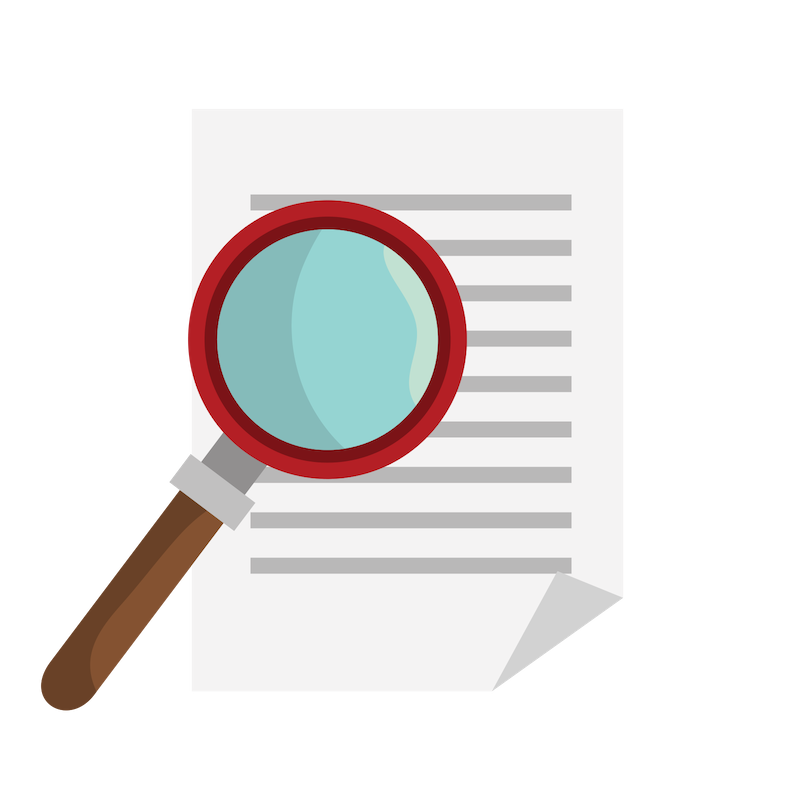 If you're still wondering whether the Brother CS5055PRW is for you, looking at similar products can help you make that decision. Perhaps a simpler machine would better suit your needs. Or one with more features. Or maybe you just want to see something similar. In any case, it's always good to check out the competition. If you're just starting out, and are, perhaps intimidated by the interface of the Brother CS5055PRW, you might want to take a look at a manual machine like the Singer Heavy Duty. As its name states, this machine, with its various iterations (4423, 4432, 4452, etc.) is a simple machine made for heavy work. It's famous for eating its way through multiple layers, and its metal construction and serious motor are the very definition of "heavy duty." It's a tank, but it's a well-loved tank. It's made numerous "best of" lists, including ones from Good Housekeeping and The Tool Report. If you're looking for a simple sewing machine, you can't do much better than this one. It doesn't have a lot of fancy stitches, but what it does, it does well. Also, as a manual machine, it gives you ultimate control over your stitch length, width, and thread tension. 79 percent of nearly 3,000 Amazon customers give this machine four or five stars out of five. 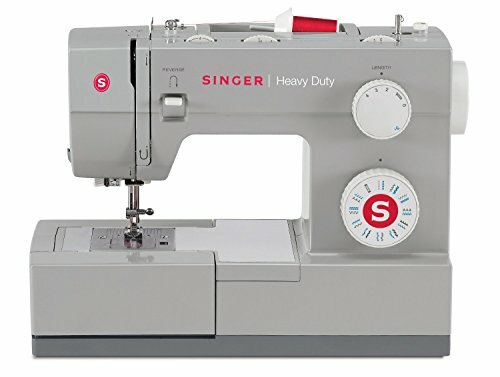 You can find the different variations of the Singer Heavy Duty Machine from various retailers. 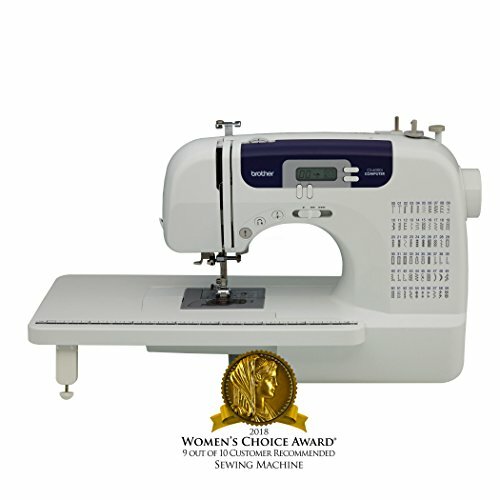 The Brother CS6000I is another electronic sewing machine that is popular with beginners and home sewing enthusiasts. The interface looks similar, and in functioning, the CS6000I is not vastly different. The main differences are stitches, stitch functions, and buttonholes. The CS6000I has slightly more of each. It also has speed control, which the Project Runway machine does not. In addition, unlike that Project Runway machine, the CS6000I comes with a removable free arm and a wide table. There is also a much more extensive accessories pack, including 15 different presser feet. On the downside, numerous Amazon customers reported frustration with the more complicated interface. If you're looking for something that will stretch you a bit more -- but not a lot more -- the CS6000I is probably the better machine. You can find the Brother CS6000I at many different retailers. If you've read through to this point and come to the conclusion that you need something more advanced, you're in luck. There are plenty of options available to you. One machine that we like a lot is the Janome Memory Craft Horizon. Like the Singer Heavy Duty, there are a few variations on this, but we're going to talk about the 8200QCP. This is a complicated computerized machine. It has 120 built-in stitches, seven buttonhole stitches, and a monogram font. It's fast -- up to 1,000 stitches per minute, but also has the all-important speed control. It also comes with a knee lifter for quilters, and an impressive accessory pack that includes 16 presser feet. Sewing Insight was very impressed with this machine's delicate and intuitive handling. It's a lot of machine, they felt, but not overwhelming to master. They also liked how quiet it was. You will pay for your thrills, though because it is expensive. But if you're looking for a machine that will stretch you and keep you learning for years to come, this could be the one. If you're looking for a high-quality all-purpose sewing machine for general home sewing, this one could be well worth your time. There's a nice, but not overwhelming variety of decorative stitches, functional stitches, and buttonholes. And the machine is adequate for general garment-making, quilting, and decorative needs. We think the Brother CS5055PRW may be particularly well suited to beginners, given the price, the presence of necessary features, and the absence of a lot of unnecessary price-inflating ones. For your general home sewing needs, this machine will do you well. Advanced and semi-professional textile artists may find this machine limiting, however. It's not as feature-rich as many more expensive machines. Also, it doesn't come with function-specific features such as a removable longarm, a knee-lifter, or stitch-editing capabilities. But for most people's purposes, the Brother CS5055PRW is a good all-arounder. What kind of sewing do you like to do best? And what's the best machine for it, in your opinion? Tell us in the comments! Next articleDo You Need A Commercial Sewing Machine? If So, Which Is The Best?